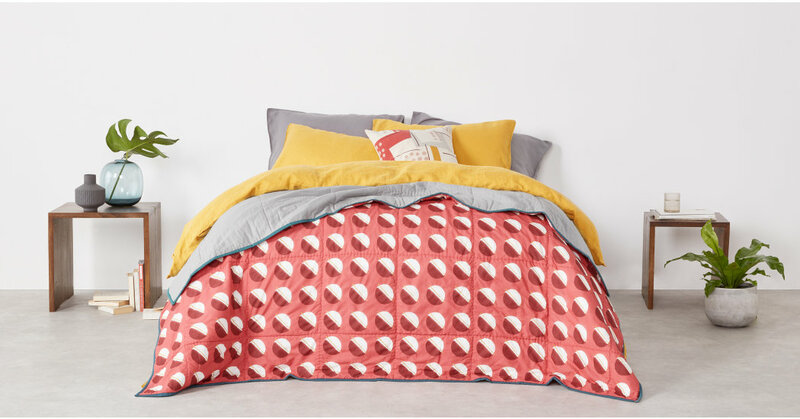 Meet Chalbi, a bold printed bedspread perfect for adding an additional layer of comfort and style to your bedroom. Choose from a contemporary circular print, or opt for sleek, simple grey in the reverse, finished with teal piping. Chalbi is the work of renowned pattern designer and colourist, Rebecca Hoyes. With over twenty years in the industry, Rebecca’s signature modern aesthetics explore materials and processes, blending traditional and contemporary craft techniques. It’s crafted from pure cotton and hand stitched for a quality finish. Complete the look by pairing the bedspread with the matching cushion.